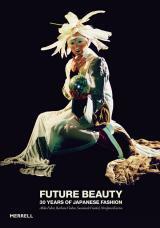 Future Beauty is the first comprehensive survey of Japanese avant-garde fashion of the last 30 years. Such designers as Issey Miyake, Yohji Yamamoto and Rei Kawakubo made an enormous impact on the world fashion scene in the late twentieth century, challenging established notions of beauty and turning fashion into art. Today a new generation of radical designers, among them Tao Kurihara and Jun Takahashi, is fast gaining acclaim. This spectacular book, written by a team of experts led by the eminent fashion historian Akiko Fukai, explores the distinct sensibility of Japanese design – the uniqueness of its form, cut and fabric. Illustrated with over 250 photographs and sketches, Future Beauty is an authoritative and stylish guide to some of the world’s most expressive fashion. Akiko Fukai is Director of the Kyoto Costume Institute, Japan. Hirofumi Kurino is a Japanese fashion expert and writer. Barbara Vinken is a professor of literature at the University of Munich and the author of Fashion Zeitgeist: Trends and Cycles in the Fashion System (2005).